There is one question that always comes up whenever we decide to buy a new television: "what size TV do I want?" It's an important question because you will be stuck with that size until your next TV upgrade. However, Samsung may be about to make it redundant by introducing a modular TV design. As The Verge reports, at CES this week Samsung is showing off a new concept display it is calling "The Wall." Very little is known about how The Wall works and Samsung isn't saying much for now. What we do know is it relies on bezel-less modules each of which form a display. They use MicroLED technology allowing each LED to emit its own light without need of a separate backlight. The Wall on display at CES is 146-inches, but Samsung is suggesting consumers will be able to decide what size and shape they want and then change it in the future by adding more (or removing) MicroLED modules. 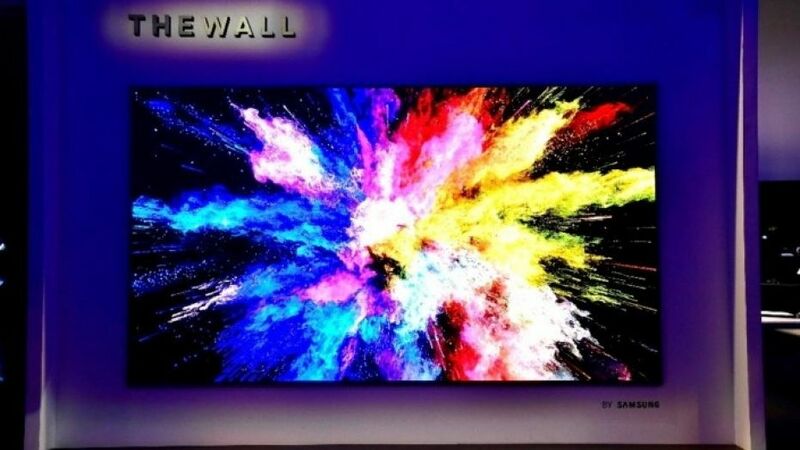 Jonghee Han, President of Visual Display Business at Samsung Electronics, explained it as follows, "As the world's first consumer modular MicroLED television, 'The Wall' represents another breakthrough. It can transform into any size, and delivers incredible brightness, color gamut, color volume and black levels." Key information that's missing right now includes how big each module is, what resolution they are, how they fit together to make a seam-free image, and how much they will cost. Even so, if Samsung has managed to create a modular display that offers perfect picture output it could revolutionize the TV industry. Shipping a pack of modules for a consumer to construct at home is much easier than a huge, super-thin and fragile TV.